EXCLUSIVE: One of Sidney Nolan's Ned Kellly series of paintings, coming to Geelong next month. A man whose car allegedly struck an elderly pedestrian at Belmont without stopping is free on bail before facing court on charges including dangerous driving causing serious injury. The 38-year-old from Highton allegedly hit the woman 30 seconds after leaving the scene of a separate “accident” with another vehicle on 11 January, police said. A 76-year-old passenger has died in a head-on crash at Anakie. The woman’s 81-year-old driver husband was seriously injured on Monday and the other car’s sole occupant, a Corio man aged 43, was “assisting” with enquiries while hospitalised in a stable condition, police said. 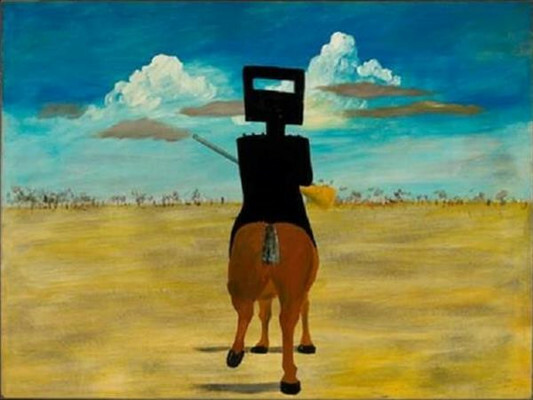 Geelong Gallery will exhibit the entire series of Sidney Nolan’s iconic Ned Kelly paintings as part of its first tour in 15 years, promoters have announced. The gallery would be the exclusive Victorian host of the internationally renowned paintings during the Geelong leg of the tour from 2 March to 26 May, the promoters said. A Winchelsea man shone a laser on an Air Wing helicopter “a number of times” as it flew over Geelong around 3am Thursday, police have alleged. The 32-year-old was due to face court on charges including possess/use a prohibited weapon and reckless conduct endangering life when the Indy went to press later the same day. Hire-car audio warnings for foreign tourists to drive on the left could reduce the Great Ocean Road’s number of “moving time bombs”, according to Corangamite MP Sarah Henderson. She raised the possible technological initiative while announcing a public meeting at Apollo Bay on 15 February to discuss recent “very concerning incidents involving international drivers”. Police have arrested a 53-year woman after fire gutted a unit at Leopold’s Pelican Shores Lifestyle Village for over-50s. The woman was found outside the unit as five CFA appliances extinguished the “suspicious” fire on Monday night, police said. Authorities have failed to find evidence of a suspected “cancer cluster” on the Bellarine Peninsula. The all-clear followed an investigation of claims of a cancer outbreak among former students of a Bellarine Secondary College campus once sited on land previously treated with a now-banned pesticide.